McAllen is the largest city in Hidalgo County, Texas, United States, and the 22nd-most populous city in Texas. It is located at the southern tip of the state in the Rio Grande Valley. 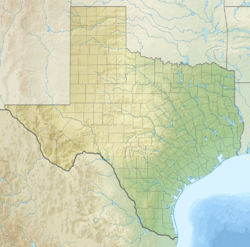 The city limits extend south to the Rio Grande, across from the Mexican city of Reynosa, and McAllen is about 70 mi (110 km) west of the Gulf of Mexico. As of 2017, McAllen’s population was estimated to be 142,696. It is the fifth-most populous metropolitan area in the state of Texas, and the binational Reynosa–McAllen metropolitan area counts a population of nearly 1.52 million.
" The City of Palms"
From its settlement in 1904, the area around McAllen was largely rural and agricultural in character, but the latter half of the 20th century had steady growth, which the metropolitan area still experiences today. The introduction of the maquiladora economy and the North American Free Trade Association led to an increase in cross-border trading with Mexico. In 1904, the Hidalgo and San Miguel Extension (now the Sam Fordyce Branch) of the St. Louis, Brownsville and Mexico Railway reached the Santa Anita Ranch. John McAllen and his son James donated land to the railroad to guarantee it would cross the area. On December 5, 1904, the McAllen Townsite Company was formed by Uriah Lott, Leonidas C. Hill Sr., John McAllen, James Ballí McAllen, and John J. Young. The new community, which was named for John McAllen, had the depot nearest the county seat, Hidalgo, 8 mi (13 km) to the south. By 1911, 5,000 acres (2,000 ha) were under cultivation in East McAllen, with produce consisting of cotton, alfalfa, broom corn, citrus fruits, grapes, and figs. East McAllen had an estimated population of 1,000 that year, and West McAllen had ceased to exist. In 1911, the town applied for and was issued a charter of incorporation under the name McAllen. In 1916, 20,000 New York state troops were stationed at McAllen to help quell border disturbances. The resulting economic boom increased the population from 1,200 in 1916 to 6,000 in 1920. McAllen adopted a home rule charter in 1927. Canning factories, a winery, tortilla plants, wood-working plants, and some oil exploration increased the population to 9,074 by 1930. In 1936, Hiram Garner opened the Valley Distillery, Incorporated, which produced wines from citrus juices. The town was a petroleum and farm chemurgic center with a population of 11,877 in 1940, by which time it had adopted the nickname "The City of Palms". In 1941, a suspension bridge replaced the old bridge from Hidalgo to Reynosa in Tamaulipas; the new toll bridge was purchased by McAllen and was named the McAllen–Hidalgo–Reynosa International Bridge. Its construction resulted in increased tourist trade, making McAllen a winter resort and port of entry to Mexico. The discovery of oil in the Reynosa area in 1947 resulted in a large migration of people from the Mexican interior, constituting a new tourist market and cheap labor supply for McAllen. The sister cities were linked as a result of the increased traffic between them. The population of McAllen was 20,005 in 1950 and 32,728 in 1960. The McAllen–Hidalgo–Reynosa International Bridge was the number-two port of entry into Mexico in 1954. McAllen was an agricultural, oil, and tourist center in 1970, when the population reached 37,636. By the start of the 1970s, McAllen had a 200-bed hospital and a new air-conditioned high school, the first school in the nation featuring on-site power generated by natural gas-powered turbines. The tourism industry continued to expand as people traveled to the area from both Mexico and the northern United States. The population continued to grow steadily through the 1970s, and reached 66,281 by 1980. During the late 1980s, the McAllen Foreign Trade Zone was an important general-purpose foreign trade zone. At the time, McAllen's main industries were retail, tourism and farming, and each was in trouble. The devaluation of the Mexican peso in the 1980s put a damper on cross-border shopping; local tourism was down because of the recession. In 1983, a freeze took out much of the valley's citrus crop. In the mid-1980s, fueled by trade and the growth of the maquiladora (in which components are shipped to Mexico, assembled, and shipped back), the economy began to improve in Hidalgo County. McAllen sits across the border from Reynosa, a large manufacturing center. After the peso devalued, coaxing companies to put their plants in Mexico with support operations in Texas became easier. President Trump held a briefing with the border agents at the patrol station here in January 2019 during the United States federal government shutdown of 2018–2019 over the Mexico–United States barrier. The city has become a focal point for concerns about the border as border crossing is a daily event for many and is a key component in the local economy. Homeland Security Secretary Kirstjen Nielsen visited the Border Patrol station here in March 2019. She mentioned how she talked to Acting Defense Secretary Patrick Shanahan on a regular basis. The Marine Corps Commandant General Robert Neller had expressed concerns about the impact of border support on combat readiness for the troops. In order to deal with over crowded facilities in 2019 for asylum seekers, immigration authorities were releasing a few hundred people daily to private groups that assist them with basic needs and travel arrangements. After the U.S military troops placed razor wire coils at the border, the mayor emphasized how safe and secure the city is. Portions were removed by the city that were considered unnecessary. U.S. military troops are prohibited from carrying out law enforcement duties. During border support activities, they are not allowed to detain migrants or seize drugs. They have assisted the Border Patrol by using military helicopters to carrying border patrol agents to and from locations along the Mexico–United States border and maintaining vehicles. McAllen is located in southern Hidalgo County at 26°12′59″N 98°14′11″W﻿ / ﻿26.21639°N 98.23639°W﻿ / 26.21639; -98.23639 (26.216263, −98.236385). It is bordered to the southwest by Granjeno; to the west by Mission, Palmhurst, and Alton; to the north by Edinburg, the Hidalgo county seat; to the east by Pharr; and to the south by Hidalgo. 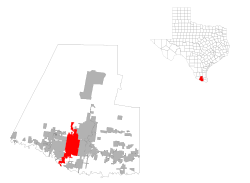 The McAllen city limits extend to the southwest as far as the Rio Grande, directly north of Reynosa, Tamaulipas, in Mexico. The Anzalduas International Bridge crosses the Rio Grande at this point, 11 mi (18 km) southwest of downtown McAllen. McAllen is 238 mi (383 km) south of San Antonio, 148 mi (238 km) southeast of Laredo, 60 mi (97 km) northwest of Brownsville, and 150 mi (240 km) northeast of Monterrey. 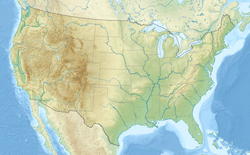 According to the United States Census Bureau, the city has a total area of 48.6 square miles (126.0 km2), of which 48.3 square miles (125.2 km2) are land and 0.3 square miles (0.8 km2), or 0.62%, is covered by water. Although McAllen is named the "City of Palms", tropical vegetation is only locally dominant. Many thorny shrubs and deciduous trees occur in the area, such as the Rio Grande ash (Fraxinus berlandieriana), cedar elm (Ulmus crassifolia), and honey mesquite (Prosopis glandulosa). McAllen, like much of South Texas, has a subtropical climate. Under the Köppen climate classification, the city features a hot semiarid climate, featuring long, very hot and humid summers, and brief, warm winters. The average high in January is 70 °F (21 °C), and the average low is 50 °F (10 °C). In August, the average high is 96 °F (36 °C), and the average low is 76 °F (24 °C). The warm season is extremely long, as average high temperatures from May through September are above 90 °F (32 °C) and average low temperatures are above 70 °F (21 °C), with relatively high dew point values, resulting in higher relative humidity values and heat index values. Heat indices consistently reach over 100 °F (38 °C) during these months. Average annual precipitation is only 21.60 in (549 mm). Most precipitation occurs in the warm season, with the least precipitation distinctly occurring in the cooler winter. As September is the peak of the north Atlantic hurricane season and tropical storms and hurricanes occasionally drop copious amounts of rainfall on the region, this month tends to be by far the wettest, averaging 4.08 in (104 mm) of rain. The driest month is March, with only 0.72 in (18 mm) of precipitation. Since 1941, it has snowed once, when the city received 1.7 in (43 mm) on December 25, 2004. Temperatures frequently rise above 100 °F (38 °C) from June through August. The highest temperature ever recorded in McAllen was 110 °F (43 °C), once in 1998 and once in 1999. The lowest temperature ever recorded in McAllen was 13 °F (−11 °C), on January 12, 1962. As of the census of 2010, 129,877 people, 41,573 households, and 31,823 families resided in the city. Of the 45,862 housing units, 4,289, or 9.4%, were vacant. The racial makeup of the city was 83.9% White, 0.9% African American, 0.4% Native American, 2.6% Asian, 0.02% Pacific Islander, 10.4% some other race, and 1.8% from two or more races. Hispanics or Latinos of any race were 84.6% of the population. Of the 41,573 households, 46.0% had children under the age of 18 living with them, 52.2% were married couples living together, 19.0% had a female householder with no husband present, and 23.5% were not families. About 19.1% of all households were made up of individuals, and 23.9% were someone living alone who was 65 years of age or older. The average household size was 3.10, and the average family size was 3.58. In the city, the population was distributed as 30.1% under the age of 18, 9.6% from 18 to 24, 28.1% from 25 to 44, 21.3% from 45 to 64, and 10.9% 65 years of age or older. The median age was 32.2 years. For every 100 females, there were 91.5 males. For every 100 females age 18 and over, there were 87.2 males. For the period 2012-2016, the estimated median annual income for a household in the city was $45,568, and for a family was $50,184. The per capita income for the city was $21,726. About 22.5% of families and 25.7% of the entire population were below the poverty line, including 36.6% of those under age 18 and 21.4% of those age 65 or over. The Rio Grande Valley began its rapid development with the introduction of irrigation in 1898 and the construction of the railroad in 1904. These major additions turned a once relatively desolate area into a major agricultural center. Throughout much of the 1900s, McAllen was a rural, agriculture-based economy characterized by sporadic growth. Today, the area is transforming into a major international trade area. As recently as 1990, McAllen's unemployment rate was at 22.6%. By the end of 2005, that figure had dropped to 7.7%. However, in 2011, census.gov listed the McAllen metro area the poorest in the nation. As of 2012, the average cost of a home in McAllen was the third-least expensive in the country, at $178,000, while average monthly rent for a two-bedroom apartment was $708. In 2012, the cost of living in McAllen was 16.2% lower than the national average. Since the 1980s and especially since the ratification of the North American Free Trade Agreement in 1994, the focal point of economic activity has shifted from agriculture to international trade, health care, retail, and tourism. The McAllen Foreign-Trade Zone (FTZ) is located south of McAllen between McAllen and Reynosa. Commissioned in 1973, it was the first inland foreign-trade zone in the United States. Also, an FTZ designation site is at the McAllen Miller International Airport to facilitate air cargo needs. Under U.S. and Mexican laws and NAFTA provisions, the FTZ designation offers specific cost-saving opportunities to manufacturers. Products can be brought into the FTZ duty-free. Services have recently expanded to include full logistic support services, including public warehouse services such as pick and pack, order processing, inventory control, incoming/outgoing quality inspection, and kitting. McAllen was the most obese metropolitan area in the country in 2012, with 38.5% of the adult population considered obese. The high obesity rate has likely contributed to area residents' poor health. More than 21% of the population has been diagnosed with diabetes, more than any other metro area in the United States. Poverty may play a large role in the community's health problems, as well. Over 25% of the city population was living below the poverty line during the period 2012-2016. More than 29% of the population also lacked health coverage during that time. The vast majority of the McAllen metro area is located in a food desert, indicating a severe lack of access to healthy foods for residents. McAllen is featured in Supersize vs Superskinny, a British television programme on Channel 4 that features information about dieting and extreme eating lifestyles. One of the main show features is a weekly comparison between an overweight person and an underweight person. In the show, the overweight participant visits morbidly obese McAllen residents to find motivation for lifestyle and diet changes. McAllen was the focus of a 2009 article in The New Yorker by Atul Gawande entitled "The Cost Conundrum", an inquiry into the factors that contribute to the cost of health care. The McAllen area had the highest taxpayer-sponsored spending per beneficiary in the United States, despite areas with similar demographics and health profiles having half the cost per recipient. The article noted that while the area has a higher prevalence of obesity and diabetes, its rates of infant mortality, HIV, and tobacco use were lower than the national average. The Texas Department of Criminal Justice operates an office in McAllen. The United States District Court for the Southern District of Texas McAllen Division is located at Bentsen Tower 1701 W. Hwy. 83, Suite 1011, McAllen, Texas. The United States Postal Service operates two post offices in McAllen, the McAllen Post Office located at 620 Pecan Blvd and the McAllen Downtown Post Office at 406 12th Street. The United States Border Patrol McAllen Station is located at 3000 West Military Highway. The United States Border Patrol Central Processing Center is located at 3700 W Ursula Avenue, McAllen, Texas. The 2LT Luis G. Garcia United States Army Reserve Center located at 600 S Col Rowe Blvd is home for the U.S. Army Reserve 961st Quartermaster Company, 461st Transportation Detachment, and 519th Transportation Detachment. McAllen is represented in the United States House of Representatives by two Democrats: Vicente González of the 15th Congressional District, and Henry Cuellar of the 28th Congressional District. Metro McAllen (formerly McAllen Express Transit - MET) has provided public transportation for the city of McAllen since June 1997. In the beginning, McAllen's public transportation system, McAllen Express, was administered by the Lower Rio Grande Valley Development Council. Since 2005, Metro McAllen has been operated as a department of the city of McAllen. Metro McAllen now has seven fixed routes serving residents and visitors of McAllen. It operates six days of the week, 13 hours per day. LRGVDC continues to operate regional buses under the name Valley Metro. Downtown bus terminal The city of McAllen also operates the bus terminal facility in downtown McAllen, known as McAllen Central Station. Central Station serves as a hub for MET and for 14 private domestic and international bus lines. Around 60 buses depart from Central Station on a daily basis. Interstate 2 travels through McAllen from Taylor Road to Sugar Road. U.S. 83 travels through McAllen as its major east-west artery. It runs directly south of downtown McAllen. State Highway 107 travels east through McAllen into downtown Edinburg, where it intersects the Business Route of US Route 281 and then I-69C/US 281. State Highway 336 travels north to an intersection with FM 1016 in McAllen to an intersection with I-2/US 83. State Highway 495 travels through McAllen from FM 2220 (Ware Road) to FM 2061 (McColl Street). McAllen Miller International Airport is served by American Airlines with non-stop service to Dallas/Fort Worth; by United with non-stop service to Houston; by Aeromar with nonstop service to Mexico City; and by Allegiant Air with nonstop flights to Las Vegas and with seasonal service to Los Angeles and Orlando-Sanford. South Texas College has over 27,000 students spread across their five campuses in Hidalgo and Starr Counties and the eSTC virtual campus. 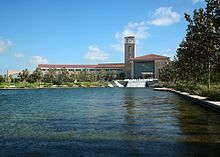 The main campus is in McAllen. The McAllen Independent School District serves most of the city. Portions of the city extend into the Edinburg Consolidated Independent School District, which operates two elementary schools within the McAllen city limits. The Hidalgo Independent School District, Pharr-San Juan-Alamo Independent School District, Sharyland Independent School District, and Valley View Independent School District also serve McAllen. The Catholic Diocese of Brownsville operates Our Lady of Sorrows School, an elementary and middle school. McAllen Public Library operates a main library and two branches, the Lark Branch and the Palm View Branch. The New Main Library opened in the fall of 2011 inside a former Walmart. The library earned high praise and became the recipient of the International Interior Design Association's 2012 Library Interior Design Awards. Birdwatching – McAllen is positioned on the migratory path between North and South America, presenting bird and butterfly expeditions. The landscape hosts a diverse wildlife population. The Quinta Mazatlan is a historic Spanish colonial mansion and is McAllen's wing of the World Birding Center. The McAllen Dog Park is a place of recreation for dogs of all sizes. The lighted park is located off Tamarack and 2nd Street. The park is divided into two sections. The Bicentennial Bike Path runs all the way from Highway 83 on McAllen's south side to Bicentennial and Nolana on McAllen's north side. The Zinnia Spray Water Park is McAllen's first sprayground park. It is located at 29th and Zinnia Ave.
Palm View Golf Course is located on South Ware Road just south of Highway 83. The golf course has 18 holes plus a driving range. This course hosts numerous tournaments year round. Until 2014, McAllen was home to the Texas Thunder of the independent United League Baseball, who played at Edinburg Stadium. Dynamo South Texas Academy is a soccer development academy created in 2007 by the Houston Dynamo of Major League Soccer. The Dynamo announced the creation of the Dynamo South Texas Academy as the franchise's first satellite academy. The Dynamo and the McAllen Youth Soccer Association partner up to develop young talent in the Rio Grande Valley region of South Texas with the DSTA's U-18 and U-15 teams, which train and compete in several South Texas cities, including McAllen, Harlingen and Brownsville. McAllen hosted the NAIA National Football Championship in the late 1970s and NCAA Division II national football championship games in the 1980s. The Cityscape of McAllen. This view is on 2nd and Ridge Road in McAllen. McAllen skyline. On far right is the Chase Neuhaus Tower in Downtown. David Cowgill, American voice actor, born in McAllen on December 8, 1960. Known for acting in movies such as: Madagascar (2005 film), Wreck-It Ralph, Mulan, Chicken Little, Tangled, Meet the Robinsons and many more. Steven J. Escobar, American movie editor and producer, born in McAllen on August 1, 1969. Known for being the editor of Big Brother (U.S. TV series). Carlos Moreno Jr, was born on December 20, 1971 in McAllen, Texas, USA. He is known for his work on Coco (2017 film), Transformers (film), and Frank & Lola. He is also a Director, Producer, Writer, Editor and Cinematographer. ^ Bogan, Jesse (April 2, 2009). "A Boom at the Border". Forbes. Retrieved Nov 22, 2011. ^ Garza, Alicia A. "McAllen". Handbook of Texas Online. Retrieved Nov 22, 2011. ^ "McAllen-Hidalgo-Reynosa Bridge". Texas Department of Transportation. Retrieved Nov 22, 2011. ^ "City History". City of McAllen. Retrieved Nov 22, 2011. ^ Pappas, Alex (January 10, 2019). "Trump highlights human trafficking as he calls for 'strong barrier' during visit to US-Mexico border". Fox News. Retrieved January 11, 2019. ^ a b c O'Toole, Molly (March 21, 2019). "Marine Corps commandant says deploying troops to the border poses 'unacceptable risk'". Los Angeles Times. Retrieved 25 March 2019. ^ Merchant, Nomaan (March 23, 2019). "Desperate migrant families overwhelm border agencies". Ventura County Star. Retrieved 24 March 2019. ^ Hennessy-Fiske, Molly (March 24, 2019). "Trump says barbed wire 'can be a beautiful sight.' Many border communities disagree". Los Angeles Times. Retrieved 24 March 2019. ^ Watson, Julie (November 19, 2018). "Migrants won't see armed soldiers on border". Associated Press. Retrieved 24 March 2019 – via Fox News. .
^ "Geographic Identifiers: 2010 Census Summary File 1 (G001): McAllen city, Texas". American Factfinder. U.S. Census Bureau. Retrieved February 15, 2018. ^ Rio Grande Valley. Wikivoyage. ^ "NOWData – NOAA Online Weather Data: Brownsville, TX". National Weather Service Forecast Office. National Oceanic and Atmospheric Administration. ^ "NowData – NOAA Online Weather Data". National Oceanic and Atmospheric Administration. Retrieved 2012-02-09. ^ a b c d "Profile of General Population and Housing Characteristics: 2010 Census Summary File 1 (DP-1): McAllen city, Texas". American Factfinder. U.S. Census Bureau. Retrieved February 15, 2018. ^ a b c "Selected Economic Characteristics: 2012-2016 American Community Survey 5-Year Estimates (DP03): McAllen city, Texas". American Factfinder. U.S. Census Bureau. Retrieved February 15, 2018. ^ Martha C. White (October 21, 2011) "Poorest place in US? McAllen, Texas, and here's why Archived 2011-11-01 at the Wayback Machine" MSNBC.com Accessed November 5, 2011. ^ "10 cheapest places to live in the U.S." 2012-11-13. Retrieved 2017-02-23. ^ "Rio Grande Valley". Texas Border Business. Retrieved Nov 21, 2011. ^ "America's Fattest Cities". 24/7 Wall Street. Retrieved July 3, 2013. ^ "The Cost Conundrum". 25 May 2009. Retrieved 16 December 2017 – via The New Yorker. ^ "History of Election of Mayors & City Officials" (PDF). City of McAllen. Retrieved April 9, 2017. ^ "Parole Division Region IV Archived September 4, 2011, at the Wayback Machine." Texas Department of Criminal Justice. Retrieved on May 21, 2010. ^ "Post Office Location MCALLEN Archived 2010-05-04 at the Wayback Machine." United States Postal Service. Retrieved on May 9, 2010. ^ "Post Office Location – DOWNTOWN MCALLEN Archived 2010-06-18 at the Wayback Machine. "United States Postal Service. Retrieved on May 9, 2010. ^ Findell, Elizabeth (July 17, 2014). "Border Patrol Opens Central Processing Facility for Unaccompanied Kids". The Monitor. Retrieved June 18, 2018. ^ Hennessy-Fiske, Molly (April 3, 2019). "Border Patrol's largest holding area — known to migrants as 'the kennel' — is overwhelmed". Los Angeles Times. Retrieved 2019-04-07. ^ "McAllen International Airport – Welcome". Mcallenairport.com. Retrieved 2011-09-04. ^ "McAllen Public Library – New Main Library – opening 2011". Mcallenlibrary.net. Retrieved 2011-09-04. ^ Lametti, Daniel; Waldman, Katy (2012-07-07). "How an Abandoned Wal-Mart Became an Award-Winning Public Library". Slate. ISSN 1091-2339. Retrieved 2016-09-03. ^ "The Quinta Mazatlan". ExploreMcAllen.com. Retrieved 2012-06-20. ^ "Zinnia Spray Park". ExploreMcAllen.com. Retrieved 2012-06-20. ^ "Palm View Golf Course". McAllen.net. Retrieved 2012-06-20. ^ "Dynamo South Texas Academy". mysasoccer.com. Retrieved 2012-06-20. Wikivoyage has a travel guide for McAllen.